Kalyani is a Yoga Instructor, Holistic Nutritionist and Bio-Energetic Practitioner currently traveling the world. 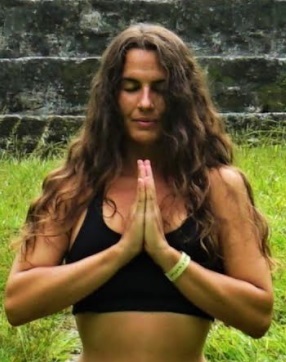 After completing her Yoga Teacher Training 200hr in India, she has become passionate about spreading awareness of proper alignment in yoga in order to minimize yoga injuries and maximize asana benefits. Her goal is to inspire the world to start their own yoga journey and to educate those who have already begun. She specializes in Yin, Hatha and Aerial Yoga, and understands the importance that multiple styles of yoga have in her own life. Kalyani understands that the foundation of health begins with homeostasis and energetic balance of mind, body and spirit. This is achieved through proper nutrition, lifestyle choices and stress-management techniques. Kalyani believes that with the proper guidance we can all achieve optimal health. I feel that I have a variety of skills that are complimentary. I am really great at motivating and inspiring those around me. I love teaching anyone who is willing to learn- whether it is yoga, volleyball, snowboarding or anything else. I use the knowledge that I have to help guide those that want to improve themselves. My ability to take constructive criticism and the want to continuously learn and improve has really gotten me where I am today. Every expert was once a beginner. I love to ask questions and to understand other opinions and viewpoints. Acquiring wisdom from those who are knowledgeable in aspects that I am interested in keeps me at my best. My aspirations are to be in a type of business setting that allows me to travel and experience different places. There are so many places around the world that I want to see. At this time, my aspirations are to inspire and teach as many people as I can to live a healthier, happier and more fulfilling life. My biggest success so far in my life has been having the ability to reach out to thousands of people through Instragram @YogaAlignment and @YogaWithKalyani to educate them about the practicing yoga safely and effectively. I got the idea after I gained new information regarding alignment during my yoga teacher training. I wanted to create a database of accurate information where people could come and reference these photos and infographics. Within 3 weeks, I had 10,000 followers and I’ve been growing it since to over 180,000 followers. I love that I am getting the word out about alignment because, unfortunately, yoga injuries are on the rise. I’m hoping to spread this empowering information for those who go to classes and practice on their own at home. I always knew that I wanted to travel to Australia, but the time was never right. I had an amazing job as a Holistic Nutritionist and Bio-energetic Practitioner at two different clinics. After months of waiting for the “right time,” being depressed and seeing many different practitioners, I decided that the time would never be right and I would have to step down from my positions if I wanted to make this happen for myself. After being scared of letting my family and my employers down, I finally decided to tell them and give them my resignation. They were so supportive. This was a life changing moment for me, but I knew I had to follow my dreams. This experience ended up being exactly what my soul needed and helped to shape me as a person and lead me to where I am today. “Everything happens for a reason.” This is a strong motto for me, especially when things don’t go my way or as planned. When something isn’t going my way, I try to let it go because I know that pushing something to happen could only make it worse. I know that when something isn’t going my way it is because there is something better coming. I love to live my life this way. My parents are my favourite role models for both business and personal. They always fed us the best organic foods, and now have their own farm so they can grow their own produce. They understand the importance of putting quality foods into the body. They also used to own a successful business and have taught me so much about being an entrepreneur. The Two Martinas- Martina Sergi and Martina Rando have been my inspiration for my Instagram accounts and I can’t thank them enough for all that they do for the yoga community! I love the beach and the mountains. Indonesia is one on my favourite places in the world and is the first area that I traveled to by myself. More specifically two little islands, Nusa Lembongan and Gili Air have my heart. The water is beautiful, the diving and snorkeling are incredible and the vibes are chill, but not too touristy. I love the people, the culture and the history of Bali- it is such a magical place. The Whitsundays in Australia are also incredible and I feel so fortunate that I had the chance to live there for almost a year. There you will find the most beautiful islands and coral in the world! Nepal was such a crazy experience when I trekked to Annapurna Base Camp and through Chitwan National Park- I definitely will be back to trek to Everest Base Camp. Banff, Canada is where I currently reside where the trees, the lakes, the snow and the mountains are all picture perfect. Goa, India and Capri, Italy also get honourable mentions. I don’t travel anywhere without my doTERRA Essential Oils- they have helped me in more ways than I can explain. I bring my GoPro and my Mirrorless Camera everywhere and I have taken hours and hours of footage with them. My most recent purchase, Dolphin Neurostim, a form of BioElectric Acupressure, is machine that helps my body with any muscle pain, injury, scarring and emotional balance. As you may be able to tell, I am a traveler. I love spending time in different areas of the world, meeting new people, seeing amazing wildlife, experiencing new things, trying new foods and going on memorable adventures. Yoga, of course, is my main focus at the moment to improve my practice and my connection with myself. I also enjoy snorkeling and scuba diving, trekking, snowboarding and beach volleyball. Let’s not forget about photography- wherever I go, I always have a camera with me! Documenting my life and my travels always brings me so much joy.